As a kid I used to devour (read a lot of) Freddy the Pig books. One of the remembered disappointments was when I found that I had read all 26 of the books and that there would not be any more. Freddy came before "Animal Farm" and had much more satisfying adventures. 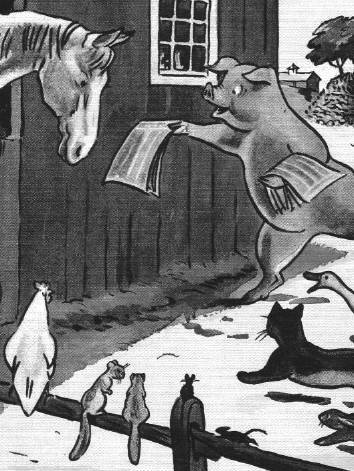 ..." loyalists have claimed Freddy as the ancestor of more famous literary pigs such as those in George Orwell's "Animal Farm" (1945). In fact, in "Freddy the Politician" (first published in 1939 as "Wiggins for President" ), the animals foil a crafty gang of woodpeckers who try to seize control of the Bean Farm by making extravagant promises - a revolving door for the henhouses, cat-proof apartments for the rats and so on. In his book "Fairy Tales and After," the critic Roger Sale pointed out that :Freddy the Politician: "not only preceded Orwell's work but is a good deal more careful with its materials and, for that matter, shrewder about its politics... The actions emerge much less mechanically than do Orwell's." Freddy's readers have called him a porcine prince, a pig of many parts, a paragon of porkers, a Renaissance pig. As the problems he faces require, he is by turns a cowboy, a balloonist, a magician, a campaign manager, a pilot, and a detective. But he is the most unheroic of heroes: he oversleeps, daydreams, eats too much and, when not suffering from writer's block, writes flowery poetry for all occasions. His tail uncurls when he gets scared. Although lazy, he accomplishes a lot, because "when a lazy person once really gets started doing things, it's easier to keep on than it is to stop."